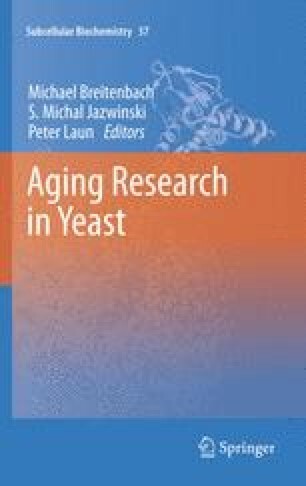 This chapter reviews the role of mitochondria and of mitochondrial metabolism in the aging processes of yeast and the existing evidence for the “mitochondrial theory of aging ”. Mitochondria are the major source of ATP in the eukaryotic cell but are also a major source of reactive oxygen species (ROS) and play an important role in the process of apoptosis and aging. We are discussing the mitochondrial theory of aging (TOA), its origin, similarity with other TOAs, and its ramifications which developed in recent decades. The emphasis is on mother cell-specific aging and the RLS (replicative lifespan) with only a short treatment of CLS (chronological lifespan). Both of these aging processes may be relevant to understand also the aging of higher organisms, but they are biochemically very different, as shown by the fact the replicative aging occurs on rich media and is a defect in the replicative capacity of mother cells, while chronological aging occurs in postmitotic cells that are under starvation conditions in stationary phase leading to loss of viability, as discussed elsewhere in this book. In so doing we also give an overview of the similarities and dissimilarities of the various aging processes of the most often used model organisms for aging research with respect to the mitochondrial theory of aging .